Order your honor flag by June 1 for the Eversource Walk for Boston Children's Hospital. With a $25 donation, you can pay tribute to someone special and help inspire our walkers. 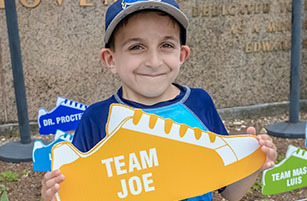 Colorful sneaker flags — honoring patients, doctors, nurses and friends — will be displayed on Walk day for all walkers and families to enjoy. Thank you for supporting Boston Children’s Hospital! Yes, I would like to receive communications from Boston Children's Hospital.